I guess this cookie is reminiscent of a Hershey’s peanut butter cup, minus the peanuts and in cookie form! So maybe not all that similar on second thoughts. 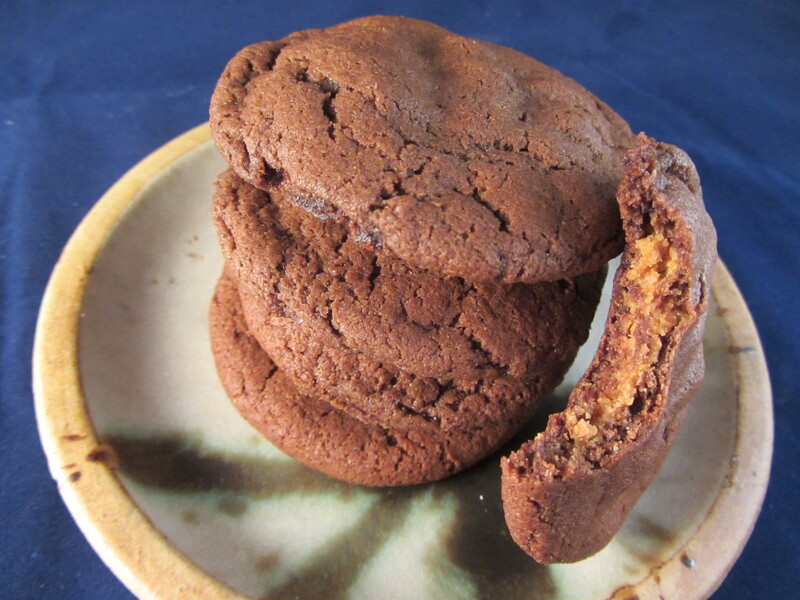 The sweet, crunchy filling is a combination of Lotus caramelised spread mixed with crushed cornflakes which is then enrobed in a chocolate dough that bakes to a crisp shell. 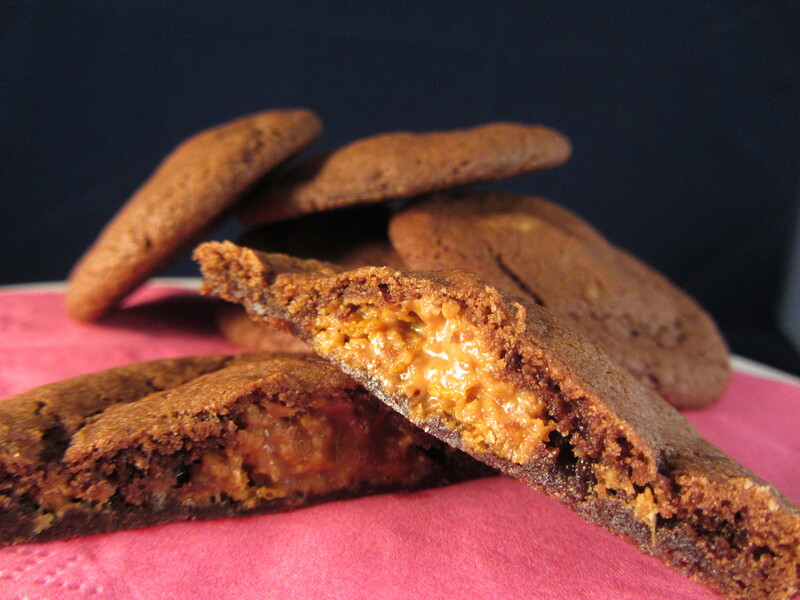 You can’t beat a sweet surprise inside a cookie and the extra crunch here gives an added unexpected dimension that really works. Quite pleased with this experiment. – Sift in the flour, cocoa, bicarb and salt and mix to a stiff dough. Set aside. – Make the filling by mixing together the Lotus spread, crushed cornflakes and icing sugar. – Take tbsp amounts of the chocolate dough and pat out to a small round. Place a tsp of filling in the middle of each and bring the sides up and around to form a chocolate ball with no gaps. – Place on a cookie sheet and slightly press down. – Bake for 10 minutes. Cool for a couple more minutes before transferring to a wire rack. – These cookies keep well for up to a week in a sealed container, and are lovely warmed for 20 seconds in a microwave before eating. 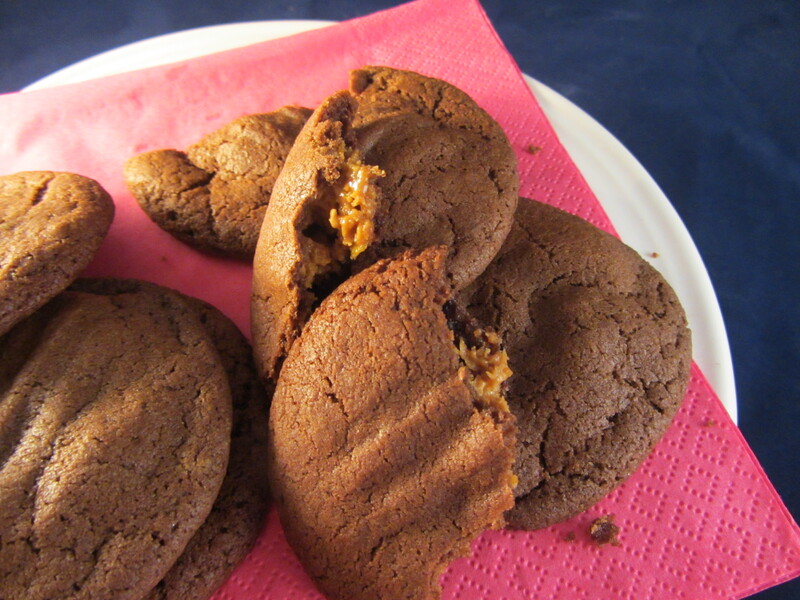 The first photo shows the cookies, warmed and with a gooey centre. The second when they have been let to cool and the centre has set. Made these today……. my boys think they are ‘very nice’!!! I think they are AWESOME!! Mine came out a little flatter than yours, but the chewiness is delicious. Thank you for sharing the recipe!